My outdoor experience began in high school with involvement in a local canoeing/camping group called Canoe Trails. The culmination was a 10-day canoe voyage through the Quebec wilds. I've been backpacking since my college days in Pennsylvania. I have completed all of the Appalachian Trail in Georgia, Tennessee and North Carolina. My typical trip now is in the Sierra Nevada in California and is from a few days to a week long. I carry a light to mid-weight load, use a tent, stove and hiking poles. 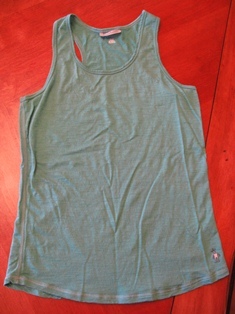 The SmartWool NTS (Next To Skin) Microweight Tank is a lightweight 100% Merino wool tank top. It has a scoop neck and a racer back. The hem is slightly rounded. The fabric weight is listed as 4.5 oz/sq yd (150 g/sq m). The top is designed to be worn as a base layer in cooler conditions and a stand-alone when things warm up. My initial impression was that the tank seemed lightweight and I liked the color. I found the website to be an accurate depiction of the product. The sizing chart put me at the low side of Medium and the tank fits a bit loosely which is perfect. The turquoise color is also what I expected based on the website. I really like the design and fit of the tank. The torso is slightly fitted for a woman unlike some tops which have a square box shape. I really appreciate this since my torso is not box shaped. I also like that the straps are wide enough and the arm holes tight enough to provide good coverage of both my sports bra and of my body. I really dislike tanks that are sagging and loose. The scoop neck is a nice depth too. It provides coverage while still being deep enough to be comfortable. The length is a bit longer than most of my shirts. 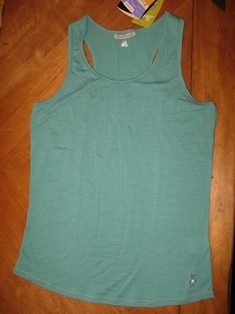 Overall, this tank design makes for a comfortable single-layer and a nice fit for layering sleeved shirts over top. I tried the tank with a daypack and like how the tank straps cover enough of my shoulders to keep the pack straps from rubbing my skin. So far I haven't hiked while wearing the tank so we'll see how it works in actual use. Washing instructions are machine wash warm on gentle cycle and tumble dry low. It also states to dry clean as necessary (seriously? ), do not bleach and iron on low. I don't plan to iron this or any other outdoor gear, so I'm hoping this instruction doesn't mean that the tank will look like it needs ironing. During the Field Testing period I wore the tank on 3 backpacking trips, 3 mountain bike rides and a day hike for a total of 11 days wearing. I machine washed it 6 times. Loon Lake, Sierra Nevada, California: 2 days, 10 miles (16 km); 40 to 65 F (4 to 18 C); 6,327 to 6,500 ft (1,928 to 1,981 m) elevation. On this trip I wore the tank both days without washing it between. I wore it with a long-sleeved sun shirt over top. Shadow Lake, Sierra Nevada, California: 2 days, 15 miles (24 km); 40 to 75 F (4 to 24 C); 6,560 to 7,940 ft (2,000 to 2,420 m) elevation. Again I wore the tank both days without washing it between. On the first day I wore it with a long-sleeved sun shirt over top. The second day I wore it with a long-sleeved synthetic shirt over top for hiking. Once we got to the car, I pulled the long-sleeved shirt off and wore the tank alone. Sequoia National Park, Sierra Nevada, California: 6 days, 60 miles (97 km); 38 to 84 F (3 to 29 C); 6,700 to 11,600 ft (2,042 to 3,536 m) elevation. I wore the tank every other day on this trip without washing it between. I alternated between wearing it alone and with a sun shirt over top. I found the Smartwool tank to be a very comfortable and useful layer. I haven't typically worn tank tops for backpacking just because I like to have some sleeve to protect my skin from the sun. 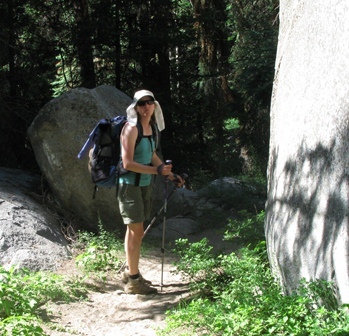 However, I really liked having a tank to keep me cooler when I was hiking in shady areas of the trail. Then in the sun, I put a long-sleeved shirt over top. There were many times (or should I say much of the time) while backpacking where I was sweating quite a bit. The tank wicked moisture away nicely and I always felt comfortable. At some lunch breaks my back was completely soaked when I took off my pack and during the time for eating lunch the shirt completely dried. I had some concern about how wrinkled the shirt would be after packing it into a stuff sack in my backpack. I also use clothing inside a stuff sack as my pillow so there were many times that I pulled the tank out in the morning to find it badly wrinkled. However with a shake and a few minutes of wearing, it looked just fine as the wrinkles came out easily. The most amazing thing to me about this shirt is its lack of aroma after wearing it. I tried to wear it a couple of times between washings to see how stinky it would get. I wore it twice on 2-day backpacking trips, two days in a row for mountain biking and 3 times (every other day) on a 6-day backpacking trip. Each time I bravely stuck my nose right into the armpit of the shirt to check how it was doing and didn't find it to be offensive. I even dared my husband to try it after the 6-day backpacking trip and he was so pleased that he asked me to buy some of these shirts for him. I haven't found the tank to shrink during washing. It has been completely durable and doesn't show any wear areas or pilling from my pack straps. During the Long-Term Testing period I wore the tank on one backpacking trip, 2 mountain bike rides and 2 day hikes for a total of 6 days wearing. I machine washed it 2 additional times. Bucktail Path, Elk State Forest, Pennsylvania: 2 days, 15 mi (24 km); 55 to 70 F (13 to 21 C); 2,100 to 2,700 ft elevation. I continued to find the tank to be a useful layer in cooler weather and a nice single layer in warm weather. I especially liked it as a sole layer during months when the sun was low enough to not risk a nasty sunburn. It layers well and is nice to have under a long-sleeved shirt on cooler mornings so that I can take off the outer layer as things warm up and have the tank ready to go. The tank has a nice fit and works well with pack straps. I never had a problem with straps rubbing my skin or feeling uncomfortable. My absolute favorite thing about this tank is that it absolutely refuses to hold any foul odors. I can wear it for multiple strenuous days in a row and not notice any aroma. The durability of the tank has been great. It looks very similar to the photo as-new. The seams are all intact. There is no pilling or snagging of the fabric. This concludes my Long-Term Testing Report and this test series. Thanks to Smartwool and BackpackGearTest.org for allowing me to participate in this test. This report was created with the BackpackGearTest.org Report Writer Version 1. Copyright 2011. All rights reserved.